Note: Use today as an active recovery day. The training sessions this week have been super challenging, and it’s only Thursday! Keep the weight light on the Kettlebell Swing, men use up to 35lb. and women up to 25lb. Wall Ball weight is up to 20lb. for men and 14lb. for women. Rest approximately one to three minutes between Sprint Rounds of Row and Wall Ball. You know it’s a good workout when nobody can stand for the group photograph! 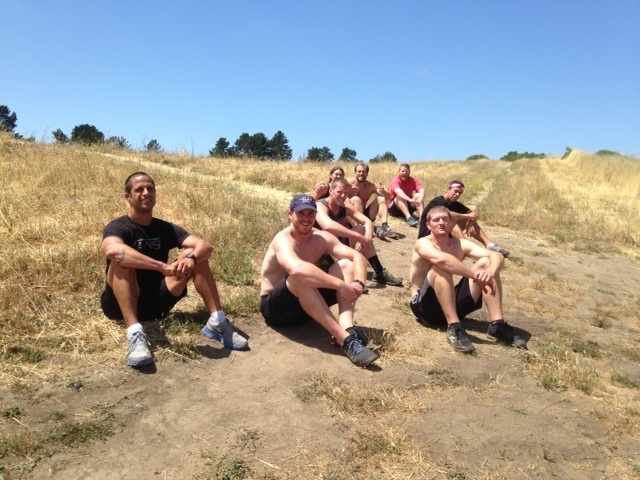 On June 3, 2014, the EWOD Athletes conquered the infamous Blue Ball Hill. The warriors in the photograph above each did 4 sprints up the hill, and several wore 20lb. weight vests during their evolutions. Great work everyone on an awesome workout. Join us tonight from 6:00 PM to 7:00 PM for the CrossFit Amundson Mobility Class located at our Krav Maga studio. The first CrossFit Amundson SUP Class is today from 1:30 PM to approximately 3:00 PM. If you’ve signed up for this workout, please be at the gym ready for transportation to the beach no later than 1:25 PM.